Noteworthy+ vs NotesTab: Which Quick Note-Taking Mac App is Best for You? For the past couple of weeks, I’ve been on the hunt for a good note-taking app on my Mac. I already use Evernote, but I’ve been looking for quicker and simpler alternative. I wanted an app that lives in the menu bar and allowed me to view my notes right from the menu bar. Also, an easy-to-remember keyboard shortcut to quickly add notes in a single step was a must. As a bonus, iOS integration is always nice to have for viewing notes on my iPad. So far, I’ve tried ShoveBox, FetchNotes and NotesTab. ShoveBox was the perfect solution, until it was abandoned by its developer; before that I had been using it for about a year. FetchNotes seemed perfect as well, but the Mac app/widget was a huge disappointment; plus it didn’t have a menu bar icon. NotesTab worked great for me and is still a favorite. I loved it because of its great features and elegant design. The only thing I didn’t like about NotesTab was having to use two keyboard shortcuts to add a new note: one to bring the app into focus and another to create a new note. So, I was back to searching for another menu bar note-taking app. Recently, I caught Noteworthy+ on sale and decided to give it a try. How does it compare to NotesTab? You be the judge. Both Noteworthy+ and NotesTab can be downloaded from the Mac App store. It doesn’t get much easier than that. The Noteworthy+ menu bar icon is a bit misleading. Just looking at it, you can’t really tell that it’s an app for taking notes. However, NotesTab has an icon that resembles a writing tablet and a pencil, so you know right away that it’s for taking notes. 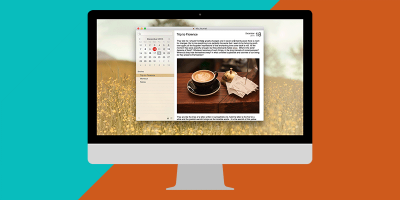 Noteworthy+ is more like a mini version of Evernote, that lives in your menu bar. I say that because you can create notebooks and then add individual notes to your notebooks. Also, you can format your notes by doing the following: changing the font type, size and color; highlighting text and changing the highlight color; adding bulleted lists; and making text bold, italicized and underlined. Noteworthy+ has conveniently added these formatting options to the side of the app window. With NotesTab you simply add notes; there are no notebooks. There also aren’t any formatting options in NotesTab. Some may prefer this though. Let’s face it, if you’re just using the app to jot down short and quick notes, this really shouldn’t be an issue. As I mentioned above, NotesTab requires two keyboard shortcuts to add a note. You can customize these keyboard shortcuts to as you’d like. With Noteworthy+, you can add a note with just a single keyboard shortcut. The only downside to this is that the keyboard shortcut is not customizable. Personally, I find the shortcut for Noteworthy+ easier to remember. Although, I think if NotesTab only needed one keyboard shortcut to add a note, it would be easy to remember as well. I also noticed that NotesTab seems to be using the same “new note” keyboard shortcut as Evernote. So be sure to change that if you’re using both apps at the same time. 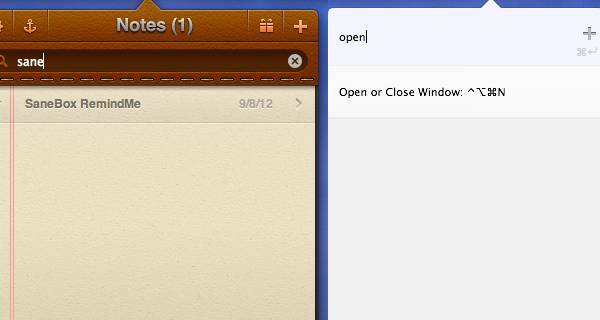 When you open Noteworthy+, you can immediately start typing to add a new note. With NotesTab, you can use the keyboard shortcut to create a new note and then start typing, or click the plus button to create a new note. Noteworthy+ is obviously quicker since there’s only one step required to add a note. 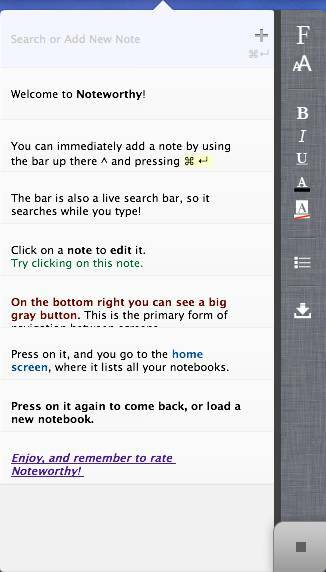 Just remember, you should already have your default notebook open in Noteworthy+ so that your note will be added to it. If you don’t have a notebook open (meaning you’re still on the “home” page), then you’ll have to select it or add a new one before adding your note. Note search in Noteworthy+ works the same way as adding a new note. As soon as you start typing, it starts searching. If a note contains the text you’ve typed, it will show up below the entry bar. You can choose to select that note or just keep typing and add a new note. NotesTab has a search bar at the top of the app window. You will have to click there and then start typing to search. So again, although it’s not difficult or time-consuming, there are still more steps required with NotesTab. Noteworthy+ has an export feature. You can export all of your notes in a single notebook to a single HTML file. You can also change the row height of your notes and show/hide the menu bar icon. 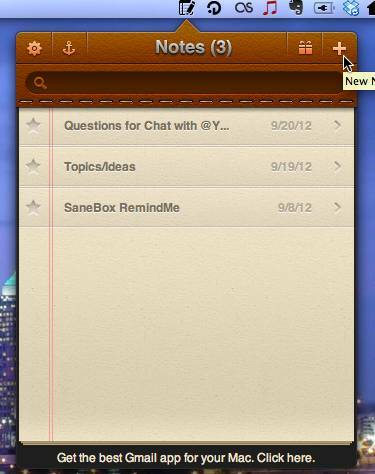 NotesTab has an awesome sharing feature so that you can share your notes via email. You can also star important notes and anchor the app window so that it remains on top of your other windows. This is great if you need to reference a note and want it to stay open and visible until you’re done. So, what’s your verdict? As you can see, both apps are meant for quick use on your Mac, yet both are differently in many ways. The one you choose will depend on what you’re looking for in a note-taking menu bar application. Do you want notebooks or just a list of notes? Do you want to format your notes or is plain text good enough for you? Do you want to share your notes with others or prefer to keep them private? In the end, as much as I love the features and design of NoteTab, I have to go with Noteworthy+ because it only requires one keyboard shortcut. I’m really disappointed that neither have mobile counterparts. Hopefully, in the near future they’ll develop mobile optimized websites or iOS/Android apps for reading and adding notes on mobile devices.